When Amazon talks about how ebooks are selling in relation to print books, as they did again this week, they are comparing apples to apples. They are comparing what their customers bought in digital form versus what they bought in print in any given period of time. 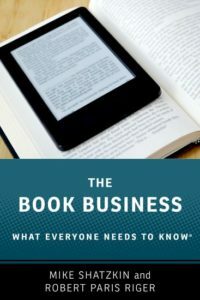 When PW or the AAP or even the publishers themselves talk about how the industry is doing selling ebooks in relation to print books, they are usually comparing apples to oranges. They are comparing what actual consumers bought from retailers in digital form with what retailers and wholesalers bought from publishers in print form for any period of time. So they are comparing ebooks that consumers actually bought now with print books that consumers might, or might not, buy later. The ubiquitously flawed comparison is fundamental to understanding many things. It is part of the explanation of why ebook penetration numbers appear to fall sometimes, even though it is counterintuitive that they would. There is probably a difference in the month-to-month fluctuations in consumer behavior purchasing print and digital books. For one thing, Christmas presents of print would tend to be purchased before December 25 and Christmas presents of ebook-capable devices would tend to result in ebook sales after December 25. (The devices would have been sold before Christmas, of course.) It might be true that people buy more ebooks in the first month or two that they own a device than they do on an ongoing basis. But analyzing ebook pentration from these numbers is much more complicated than that because we must also take into account the fluctuations in trade ordering behavior which are also partly driven by the publishers’ collective decision about when to issue new books. As frontlist-oriented as ebook consumption seems to be, the reporting of print book shipments would be even more so because big slugs of of big books are shipped to stores for publication date. Publishers tend to issue far fewer big books in January and February than at any other time of the year. The data suggest that returns fluctuation isn’t as great as shipment fluctuation, but the same returns on a lower sales base yield a higher returns percentage, or a relatively higher impact in depressing apparent print sales. The lower the print number, the higher the percentage of total sales will be of the same ebook number. So for the period left in our time of transition when Christmas presents of devices add new digital reading converts — and we certainly have one or two more Christmases like that coming, if not three or four — we can expect ebook sales surges right after Christmas that calm down in March and later. For the period left in our time of transition when there’s a significant brick infrastructure requiring inventory in anticipation of Christmas sales — and we have some more years of that to expect too — sales of print measured by publisher shipments will look much higher in the fourth quarter of the year than in the first quarter of the following year. Then, assuming the amount of shelf space lost in the post-Christmas period doesn’t cancel out the effect of more big titles coming from publishers in March and after, print sales will rise again. And for the period left in our time of transition when big publishers continue to slot big books to come in Fall in time for Christmas, hold them back at the turn of the year, and start issuing them again as we move toward the second quarter, and that also most certainly will continue for a couple more years or more because these patterns are deeply ingrained in companies resistant to change of this kind, the ordering pattern of the stores will be reinforced by the issuing pattern of the publishers. There are always other factors in play. When publishers went to agency, ebook sales briefly went down because the big publishers’ take per copy went down. A smaller version of that impact was just registered when Random House went to agency on March 1. We also have a real impact, if one that is hard to calculate, from the Borders troubles. Publishers aren’t shipping to them, and other retailers are being cautious because so much Borders inventory is competing with them at distressed prices at the moment. But the apples-to-oranges comparison, where print shipments to the sales channels are lumped with ebook consumer sales for the purposes of analysis, assures us that we’ll see some optical illusions. One of them is the apparent drop in ebook share that will be a seasonal feature of conversation for at least a couple more years. Next Tuesday afternoon there will be a memorial celebration for the life of Ruth Cavin, the longtime mystery editor at the St. Martin’s division of Macmillan, who died at age 92 in January. It convenes at 5:30 at the Salmagundi Club at 5th Avenue and 11th Street. Ruth was a childhood friend of my mother’s, close to both of my parents from their days in college, and I knew her from my Day One to her Day Last. She was a wonderful person and I hope to see many of the people who knew and loved her at the event.